A natural question when people hear about Kivy as a way to create Android apps in Python is…what can you do with it? Is it performant enough for games, can you call the Android APIs, do all apps look the same? One of the best resources for these kinds of question are existing apps, and in this post I’ll give a quick impression of three of my favourites. This is obviously highly subjective, but I’m focusing in particular on features of technical interest, apps that push Kivy beyond what’s normal to show what it capable of. If you’re interested in other examples, there’s a fairly extensive (but far from exhaustive) list on the Kivy wiki, including winners of our programming contests and many contributions from users. If you’d like to make your own apps in Python, check out Kivy (which also runs on Windows, Linux, OS X and iOS) and python-for-android (which can also package non-Kivy Python apps). You can download Boardz here. I’ve put Boardz first because it’s my single favourite Kivy app. It’s actually a work in progress (and in fact hasn’t been updated for a while), but is already a fun game showcasing some of Kivy’s more impressive performance potential. Boardz homescreen (left) and gameplay (right). The black ring on the right is the input circle controlling rider posture. Boardz is a snowboarding physics game; you control your snowboarder by touching the screen, then moving your finger with respect to its initial position to control your posture; quick movements throw your weight around and can cause you to jump, spin, or fall over, while just positioning the rider differently helps you to pick up speed or navigate barriers. The objective of the game is to get to the end of each stage, with different obstacles including slopes and jumps, collapsing structures, falling rocks, or even multidirectional gravity and rocket boosters. You can fail if your head collides with another object with too much force, or if you simply get stuck and can no longer reach the finish. What’s immediately impressive is that all this runs well as a Python powered game running on a smartphone. It achieves this by being built using the KivEnt game engine developed by Jacob Kovac, one of Kivy’s core developers. This entity based system lets you write game code in Python but internally is highly optimised in Cython, using Kivy’s OpenGL API extremely efficently as well as interfacing with the popular Chipmunk Physics engine. Boardz wipeout failure by fatal collision (left), and an ad (right). Boardz betrays its in-progress nature in other ways; you can see in the above screenshots that its UI isn’t very polished, and in this sense it’s the worst of the apps I’m showing here. However, it makes up for this with its surprisingly engaging gameplay, and a breadth of entertaining features not showcased here, including leader boards, racing your ghost, and different riders with different physics attributes. A final technical feature interesting to Kivy app developers is that Boardz includes ad integration. Regardless of your feelings about ads themselves, the ability to use them is a major feature enquiry from new Kivy users. The problem here is that integrating with a normal ad provider normally requires adding to the Java components of your app, which it may not be immediately obvious how to do from Python. There are actually a number of resources for this nowadays, with a key point being that python-for-android tries to make it easy to include extra Java code, with which you can interact from Python using Pyjnius. KivEnt’s implementation, pictured above, is a nice demonstration. You can download Kognitivo here. Kognitivo is perhaps the single most polished Kivy app on the Play store, being relatively complex, extensively customised, and exhibiting a number of nice Android API interactions. It is also (deservedly) possibly the most popular Kivy app on Google Play. Kognitivo tutorial (left), game instructions (centre) and homescreen (right). 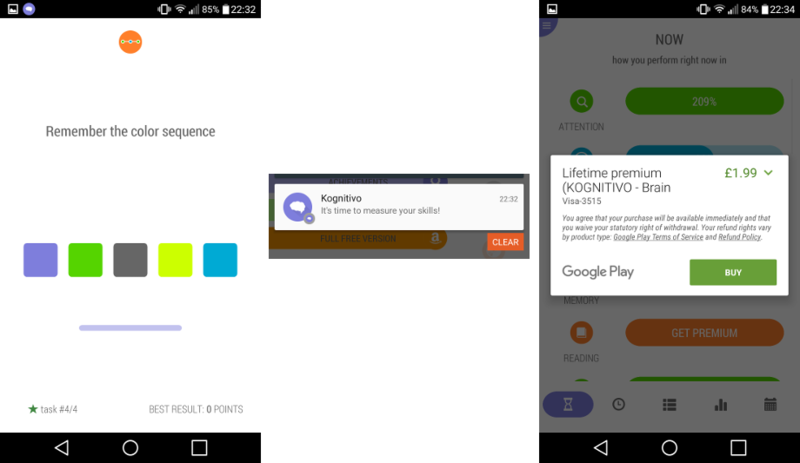 Kognitivo is a brain training and performance monitoring app. The basic structure is to perform a series of simple exercises intended to test different aspects of cognitive performance, being rated on accuracy and speed, and with the results compiled over time in order to detect and act on trends. As I’ve said already, the nice thing about Kognitivo is its huge amount of polish. It is extensively themed such that no trace of the Kivy defaults remains, runs extremly smoothly, and includes many nice animation tweaks (unfortunately not captured in screenshots) to feel responsive and active. 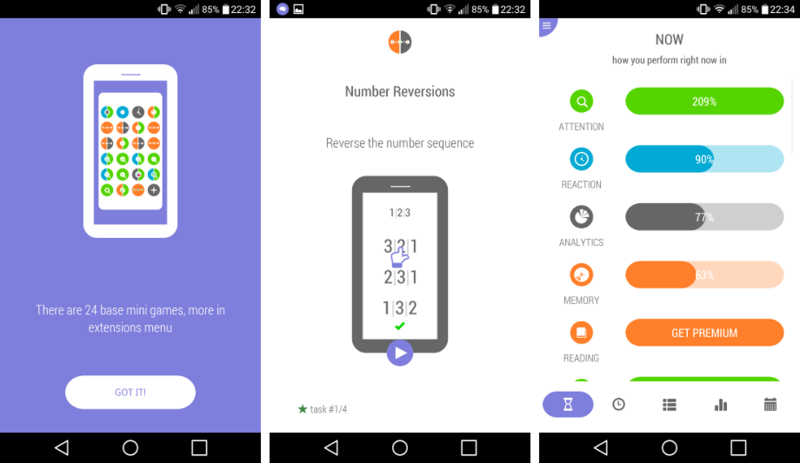 Kognitivo training game (left), Android notification (centre) and in-app purchase option (right). On the technical side, Kognitivo exhibits a number of features not normally included in Kivy applications but possible through interaction with the Android API via some Java code and/or the aforementioned Pyjnius. These include notifications, interaction with your calendar, and in-app purchases. I think the most beautiful thing in it is to use the almightiness of [Python]’s frameworks. I used sqlalchemy and sqlite as a backend, and it worked like a charm! Python is the most powerfull language because of it’s frameworks, you can even start Django on your smartphone! It’s amazing! Or twisted for asynchro communication with server. Or nltk for in-app natural language processing. Or maybe you want make a mobile equations solver with scipy and numpy. This makes all the dreams come true. You can download Barly here, or visit its own website. Barly is the most recent of these apps to appear on Google Play. I’ve chosen to include it as a nice example of pulling off its concept quite well while making good use of Kivy; like Kognitivo the app is themed very differently to Kivy’s defaults (though it doesn’t look like a normal Android app either), and is generally well put together. 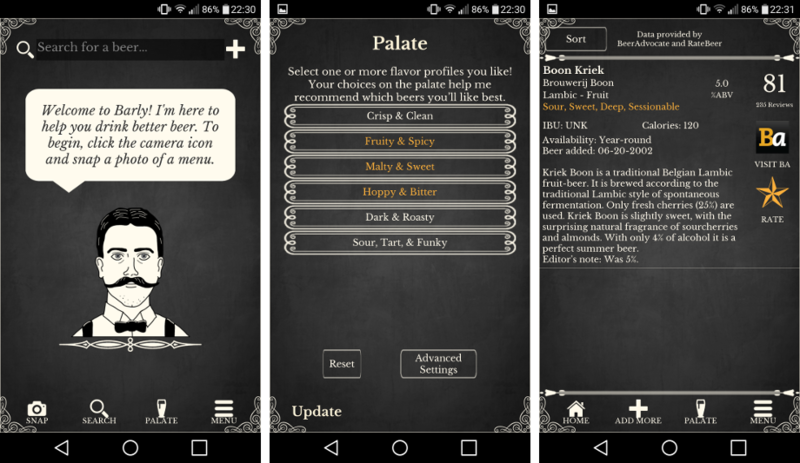 Barly homescreen (left), palate options (centre) and a beer search result (right). To quote its Google Play blurb, Barly is ‘your personal beer expert’. It provides a convenient interface to browse beers via data from standard popular websites, and according to your description of your own palate. Barly’s most interesting feature is the ability to take a picture of a beer menu and have it automatically detect what beers are listed, followed by downloading information about them to help you choose. That kind of image analysis has to be tricky, but actually didn’t perform badly when I tested it. The interface to this functionality is quite nice, switching to the Android camera app to get the image before uploading it to a server for processing (during which you can input your preferences). This functionality is possible with Pyjnius as mentioned previously, but actually in this case is an API also exposed in pure Python by Plyer (another Kivy sister project, wrapping platform-specific APIs in a Python frontend). Not all APIs can be conveniently exposed this way, and actually Barly may not even be using this particular method, but it’s a good example of functionality that can be achieved with Kivy in a particularly cross-platform way. Beyond this, Barly does not make such wide use of the Android API or unusual Kivy features, but nor does it try to; it is a nice example of a complete and self-contained Kivy app using the power of Python for an unusual and interesting goal. It’s been a long time coming, but we can finally make the announcement… python-for-android now supports Python 3 Android apps! This naturally includes Kivy, but also should work for anything else you can package with python-for-android, such as apps made with PySDL2. Using Python 3 remains experimental for now, it works but doesn’t yet perform all possible optimisations and hasn’t been as widely tested as Python 2. However, there should be no extra application requirements (beyond actually being written for Python 3), and the remaining issues and optimisations are being worked on. python-for-android is a packaging tool for turning Python applications into Android APKs. It was originally created to make apps with the very cross-platform Kivy graphical framework (though it didn’t arise in a vacuum, I think it built in particular on previous work by the Ren’Py project). However, the original python-for-android had flaws including being quite inconvenient to modify for non-Kivy apps (several other projects seem to have used modified versions, but each was performing similar changes), hard to extend for multiple architecture support, hard to extend internally (both in general and from the perspective of new contributors, as much of the toolchain was a big shell script), and only supported building apps with Python 2. We recently completed and released a fully revamped version of python-for-android aimed at fixing all of these problems, as discussed in several previous posts on this blog (originally here). Almost all of the original goals are now complete, with Python 3 support the major missing one until now, though not for lack of trying. Some technical details and basic instructions for testing the new support are given below, and you can also see the online documentation for further information. Our Python 3 support depends on the prebuilt Python distributions provided with the CrystaX NDK, a drop-in replacement for Google’s own Android NDK with many fixes and improvements. The technical details of this choice are given below, and we’ll try to further support a locally-built Python 3 option in the future. Thanks to the CrystaX team for making it so (relatively) easy! python-for-android works by bundling a Python interpreter, compiled for Android devices and architectures (usually arm, though other choices are supported), into an Android APK. The APK includes a simple Java bootstrap application, which mostly starts a Python script via JNI. The script then runs essentially as normal, almost all of the Python standard library is present and works fine, and python-for-android supports including other modules or non-Python dependencies. Pure Python modules will mostly work without special treatment, though things requiring compilation need a special recipe. Many common modules such as numpy and sqlalchemy are supported this way. Following its revamp python-for-android is now designed to support multiple kinds of java bootstrap, but the current main support is for GUI apps via Pygame (for Kivy’s old Android support) or SDL2 (both for Kivy and for anything else that can use it); SDL2 also now does much of the heavy lifting of handling events etc. itself, via its own Android support. The main problems with compiling and including Python are first that it must be patched to compile (as Android’s libc doesn’t support some things very well or at all), and second that it must be unpacked and started on the device via its C API. The second point is fiddly but ultimately not that different to working this way on the desktop. The first is (in my opinion) harder because it needs some understanding of Python’s internals, of Android’s limitations, of appropriate fixes, and of how to test and debug these problems. Such patches have been made by a number of different people for different Android versions, and I believe there has been activity on Python itself to fix some issues (including this current issue to make Python build natively on Android). For Python 2, I think python-for-android’s original patches came from here, though extended with further modifications. However, the main thing holding up my efforts to get Python 3 working was the inability to find a similar working patchset; I tried a few sources, achieving a working compilation using SL4A’s python3 patches, but I couldn’t get Python working on the device. I’m sure this was my own technical mistakes, since other projects do have it working, but it’s what was holding up the feature. I eventually resolved this by using the new Python on Android support from the CrystaX NDK. As mentioned above, this is a drop-in replacement for Google’s own NDK (the Native Development Kit providing compilers etc for targeting Android with non-Java code), including many improvements to the build environment. As of version 10.3.0, they provide prebuilt Python packages for Android on all architectures - and all of their NDK improvements mean that Python no longer even needs patching for this compilation to work. Python is provided as a zipped standard library (Python can automatically load modules from zip files), and a folder of the compiled components like ctypes (as it’s hard to dynamically load from zips). From the perspective of python-for-android, supporting Python 3 means modifying the build to load CrystaX’s prebuilt components (both in the Android project structure and in python-for-android’s support for compiling other modules), and modifying the C initialisation code for Python 3. This takes some work, but all told wasn’t very hard and the Python bundles worked with no issues, so we owe a lot to CrystaX; thanks again. I’d still like to come back to the issue of local python3 compilation; CrystaX’s versions are fine, but I’ve learned a lot from making them work, and have a much better idea of what I may have been doing wrong. However, the focus for now will be on resolving the remaining issues with what’s already working. Building Python 3 APKs is only supported in the revamped python-for-android toolchain which was merged to the master branch a while ago. It can be installed and used as described in its documentation. If you use Buildozer, it currently does not support this new toolchain, though tito has been working on this. There is also the new restriction that you must (for obvious reasons) use the CrystaX NDK, which can be obtained here; simply refer to its filepath when setting the NDK directory, and everything else should work automatically. To build for Python 3, add the python3crystax recipe to the requirements option, e.g. --requirements=python3crystax,kivy. It should mostly work automatically with existing recipes, though at this stage there may be bugs or problems with a few, and some will need modification. The exact syntax above may also change in the future as the Python 3 support becomes better integrated, but not significantly. There’s also one big change whose importance I’m not sure about; the Python 3 mechanism doesn’t currently build a local Python 3 to use as a hostpython, instead using the system python. This means that you must have python3.5 (3.4 may also work) installed locally in order for python-for-android to build Python 3 APKs. This will be fixed soon, adding a hostpython3 recipe to avoid weird bugs with system-specific differences, but you need to bear it in mind for now. For now, this Python 3 support remains experimental. I anticipate no major issues, but it’s internally a quite different method to the Python 2 support and needs further work to duplicate some of the old optimisations, and undoubtedly to fix bugs in the toolchain that will appear as it stabilises. Amongst other things, Python 3 shared libraries are not currently collected and merged (with Python 2 we did this originally to get around an Android limit but also for optimisation), python files are not precompiled to bytecode (it can make a big loading speed difference), and some features of the old pygame bootstrap have not yet been implemented in SDL2. All this and more will come in the future, but shouldn’t be hard to add now that the toolchain all works. The SDL2 bootstrap is also missing a few features that users of the old toolchain will be used to, like the splash screen image and at least one Kivy-specific function. These too are being actively worked on, especially as more people start to move their apps to SDL2. I’ve also phrased this as Python 2 built locally vs Python 3 from CrystaX, but actually CrystaX also supports Python 2.7 and I hope to add this option in the near future. As discussed in the technical details, it also should absolutely be possible to have a local Python 3 build, which I’d like to eventually come back to. We’ve just released a new stable version of Kivy, version 1.9.1. You can see the changelog on the mailing list announcement, and download the new version from the Kivy website or via your package manager. This is mainly a bugfix and tidying release following the major version 1.9 last year, but includes many bugfixes, smaller new features, and improvements to our surrounding infrastructure across almost 1000 new commits from over 70 different contributors. One major improvement for Windows users is that we now have a fully working installation method using pip and wheels for both Kivy and its non-python binary dependencies, rather than our older standalone kivy distribution. This should make it easy to install Kivy in any existing Python installation. OS X distribution has also seen improvement, including better support for working with homebrew. We’ve also improved app packaging particularly on OS X, with a new packaging method that should be easier than pyinstaller (though pyinstaller is still supported), a buildozer backend for OS X packaging (now buildozer works with Android, iOS and OS X! ), and generally improved and updated documentation for the packaging process. The documentation for Windows and Linux packaging has similarly been updated, and the new packaging methods and buildozer support will hopefully be added for these in the future. Packaging for Android with python-for-android is not tied to the Kivy update schedule in the same way, but has been seeing significant improvements and updates in the last few months, including a full revamp of the toolchain and support for many new features, which you can see in several of the recent previous posts on this blog. In the future, we’re heading towards Kivy 2.0, which we’ve had in mind for a while to be a major release with some big new features and potentially removal of some long-deprecated components. We aren’t sure on the timescale for this yet, but if it takes too long there will be other minor releases first. For other updates, watch this blog or the standard Kivy support channels. Thanks to all our contributors, and enjoy the new release!